Learning to develop B2B buyer personas is essential to building a modern marketing organization. When implemented properly these buyer personas create stronger alignment across your different departments. When developing a buyer persona some of the common traits are appearance, personality, their story, their needs, and their values. The idea behind the strategy is that once you’ve better defined your ideal customer you can better market to and sell to them. In my opinion, it’s a must for any B2B business. 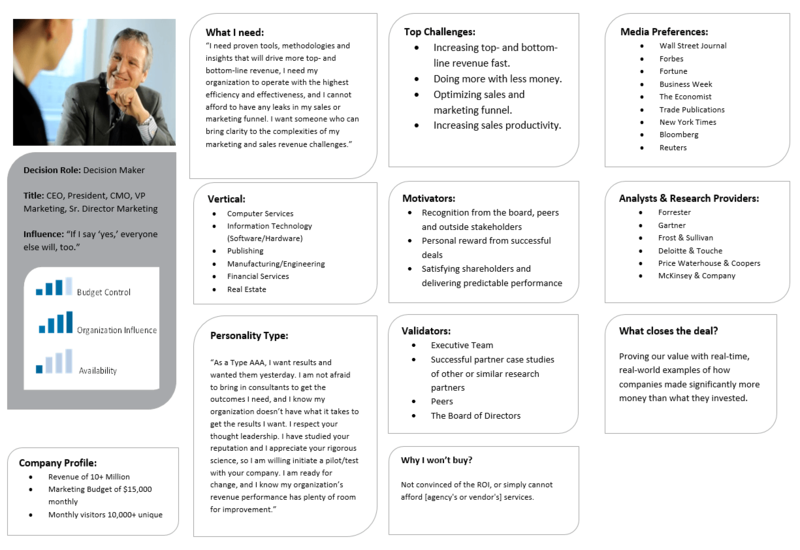 Want our Buyer Persona Checklist? Click here to download your copy and share it with your team! 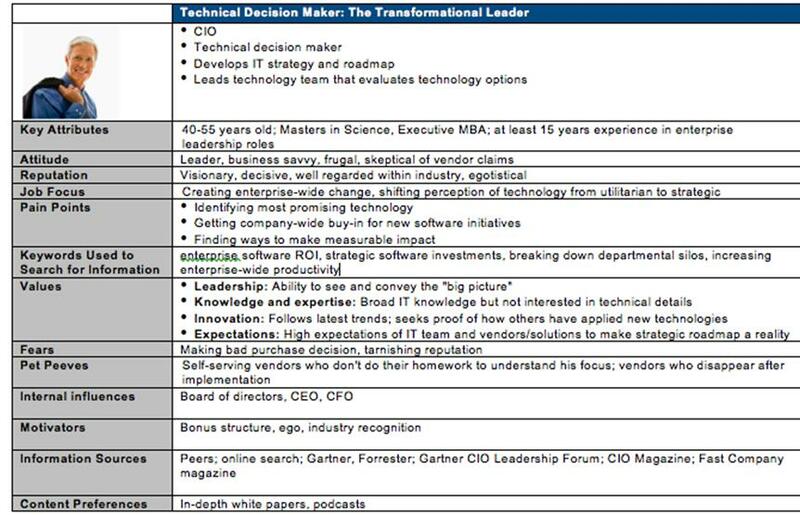 The chart below shows us the effects of creating B2B personas had on an IT company called Skytap. When Skytap developed their B2B marketing strategy their ads were twice as effective because they were targeted. This led to a 210% overall increase in website traffic. One of the problems is that typically B2B personas aren’t created properly or used correctly within an organization and this wastes time and money. Sometimes due to improper knowledge on how to develop and use B2B personas some companies even develop personas and then don’t even use them. The main problem is that developing a persona for a B2B customer is considerably different than developing a persona for a B2C. Most businesses develop B2B buyer’s personas similar to the B2C process of developing personas, which is based on demographics like race, marital status, or level of education. Some companies will dive a bit deeper and add in specific personality traits, but typically they are very basic. 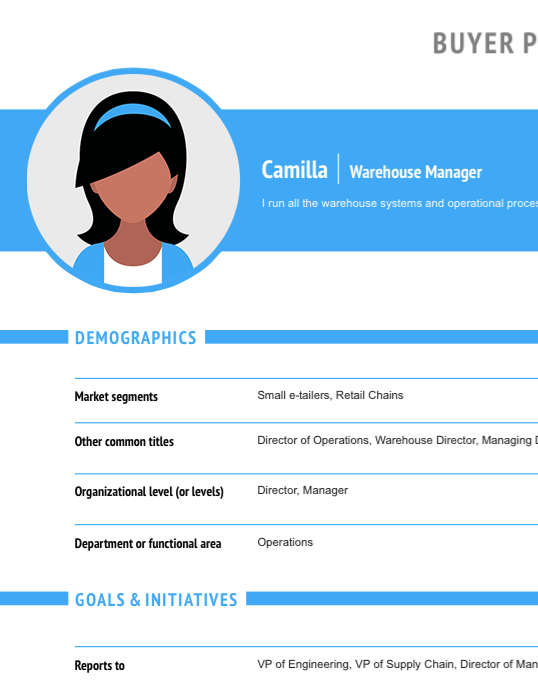 Using demographics is a great place to start when creating a B2B avatar, but businesses shouldn’t spend too much time on these demographics because they typically have nothing to do with whether a business needs complex B2B products and solutions like a marketing referral program, e-mail segmentation, or shipping integration. When developing buyer personas, especially for B2B, you should include more than just demographic statistics. Businesses that use more than just customer demographic analysis and use specific key triggers such as fears and challenges are more likely to have higher sales and perform more efficiently. They almost always meet and exceed revenue goals more often than those who only use demographics for their personas or don’t have a buyer’s persona at all. This chart shows us some of the factors that lead to a more thorough customers analysis. You probably know which department of a company would be the one to use your product, but have you determined who in that department would be able to influence the purchasing process? If the entire company would benefit from your product, then who would be the one to pull the trigger on purchasing it? Don’t waste time marketing to the wrong people or trying to sell to someone in a company that doesn’t have the authority to make a decision. There will usually be several different people in different departments who can make this decision, so try and single out who has the most influencing and purchasing power. What is stressing them out? What challenges does your product help eliminate? Why would they be afraid to buy your product? Understanding these problem areas can help you create more targeted marketing tactics. To develop an effective B2B persona we need to understand not only where the overall company is trying to go, but also the person(s) making the purchasing decision’s goals. Is the company trying to grow faster, become more efficient, cut costs? Could our product help this person move up in their company? Does our product help them get to where they are trying to go faster? Sometimes you can have a great product, but the company culture isn’t aligned with your buying cycle. For these types of companies, it usually takes something going wrong for them to make a change. What type of company could implement our product fast? Would this company be open to complex products and solutions? Does your product or solution fit in with their businesses culture? The people you are going to be selling to are going to be as busy as you are, so make sure that your product or solution actually solves a problem that they have. You may have the most amazing product in the world, but if they love the product they’re already using couldn’t your time be spent better trying to sell to a company that hates the product they’re using? How are they currently doing business? What systems do they have in place right now and what kind of problems are they causing? Which of our competitors are they using? How can we make their job easier? Can our product or solution help their company enough where they will make a switch? Surveys with customers & prospects. One of the least invasive ways to extract information from customers and prospects is to include automated surveys in your email marketing plan. Interviewing customers and prospects takes a little more work, but your customers will feel like you care and you’ll probably pick up a few prospects in the process. Take the questions above and have candid conversations with 10-20 customers and prospects to see what keeps them up at night and what’s helping them the most. Talk to your team and figure out what’s working for them and what’s not working for them. Take techniques used by your most successful salesmen and apply them across the board. Even if it’s a small database, you could find some really valuable information about who’s making purchases and why. Your executive may have some ideas that aren’t being utilized properly or at all. Just because they’re the CFO doesn’t mean they don’t have ideas on who the sales team should be targeting. These are the people that deal with your current customer’s issues and problems the most. Surveying and interviewing them will not only improve your own products and solutions, but also figure out why people are leaving their current companies to do business with yours. 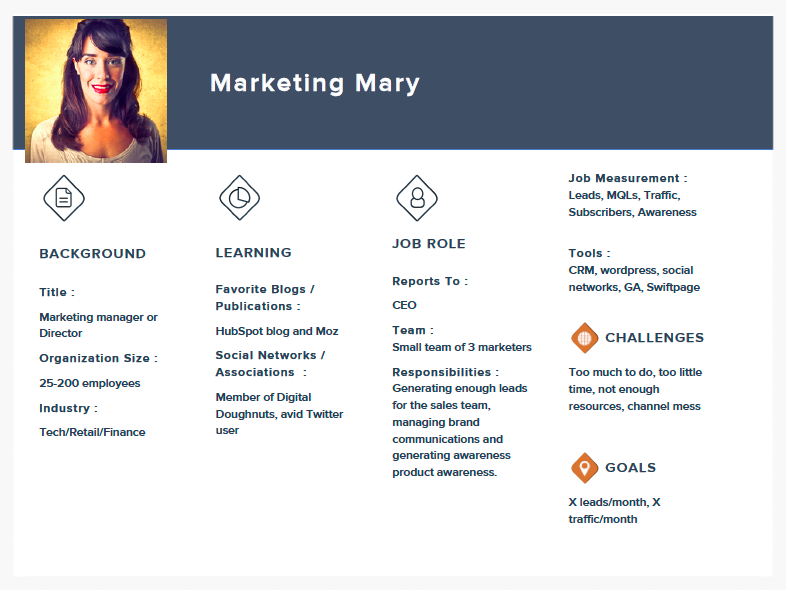 It is okay to have several B2B personas. Complex business products and solutions have multiple decision-makers in the buying process. Just make sure not to spend too much time trying to list every single purchaser or decision. There are usually only a handful that really matter. Don’t waste time on specifics that don’t really matter. Creating personas can be time-consuming and focusing on the wrong characteristics. For the purposes of your businesses does it really matter if your avatar is named John or Jim? Age 30 or 35? Has 1 kid or 3 kids? Probably not. Spend the majority of your time focusing on who is making the purchases, who your gatekeepers are, and how your product can make them look good. Navigating different corporations and businesses can take up a lot of a salesman’s time. You can consistently increase sales and decrease wasted time if you figure out exactly who to market to and contact. Far too often salesman will set up a meeting and pitch a product only to find out they’re talking to the wrong person. Obviously, we realize that no blue print is going to fit every company, but you can at least narrow it down. Incorporate your persona avatar and detailed descriptions into multiple layers of your organization. Incorporating your personas into these departments can help your personas spread throughout your company’s culture and provide lasting benefits on all areas of your business.